Now that summer is here, I tend to use the grill a lot more for both cooking and social gathering purposes. Despite the thought that mostly men do all the grilling in the household, I actually enjoy whipping up dinner on the grill. I’ll definitely admit that mastering how to grill did take me a little while, but a few burnt chicken breasts later, I finally have it down. For those of you who may be looking for new ways to grill or different ideas, I prepared a list of my go-to grilling tips that have always been helpful for me! Use coconut oil or a coconut oil spray for vegetables. Instead of olive oil, I now add a little coconut oil over my veggies for added flavor, which turn out absolutely delicious! Simply take your vegetables and place them in a basket or aluminum foil, then drizzle desired amount of coconut oil over top. If you want to save the calories, do the same with Kelapo coconut oil cooking spray. An unrefined coconut oil has a lower smoke point, so I always keep the veggies on the top shelf of the grill to keep from burning. Pack your dinner with proteins. Chicken breast, white fish filets, salmon and steak are my favorite proteins to grill. For an even better flavor, try making a healthy marinade of low-fat Italian dressing or a blend of garlic salt and pepper. Let your proteins marinate overnight or for at least 2-4 hours. Make dinner colorful. 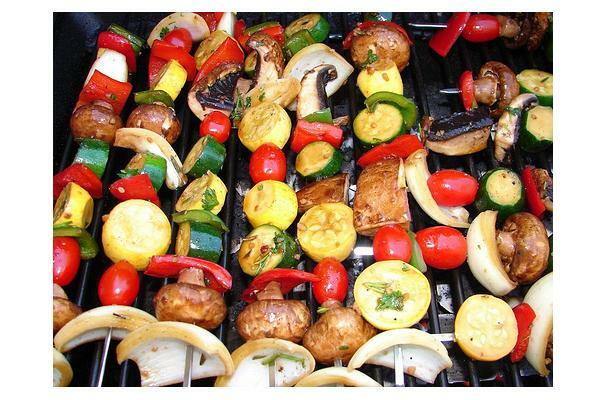 Even if using a basket or foil for your vegetables when grilling, make the colors pop! This is one of my favorite things to do when having a cookout with friends. Try selecting vegetables such as baby tomatoes, yellow squash, onions, colorful peppers, eggplant, and zucchini. Once finished and plated, the colors will go great with your main dish. Timing is key. It’s important to put your proteins on first and re-baste halfway through if needed. 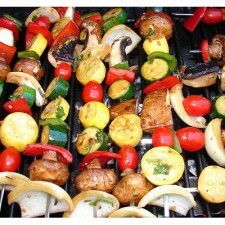 When your proteins are almost finished cooking, this is when you add your vegetables to the grill. Timing your dinner means thoroughly cooked chicken and vegetables that aren’t mushy – trust me, I have learned the hard way. Have fun with dessert. Summer desserts are my favorite! Since I don’t have a gas burner at my house, I got creative when it comes to making s’mores. Simply turn the grill on a low heat and line a skewer with desired amount of marshmallows. Have chocolate pieces and graham crackers ready to make a delicious s’more once your marshmallow is roasted. Not a s’mores fan? Try grilling fruit as another healthy summer dessert. Serve with Greek yogurt or vanilla ice cream – YUM! Hopefully these tips will help give you some inspiration for a family dinner or entertaining with friends! Now that the weather is getting warmer, enjoy the time outside and cook up good food along the way. I’m starting to get into grilling and looking for the best tips, so I will definitely have to try using coconut oil! We are so happy to hear this! Coconut oil really does go great on grilled veggies – our fav!